I enjoy walking in all its forms, from a simple stroll in the woods to multi-day backpack excursions. Though by no means an extreme ultra-light enthusiast, from spring to fall my preference is to carry a pack weight (before food and water) of 12 lb (5.5 kg), more or less. In recent years, I've rapidly moved to a philosophy of "lighter is better," within the constraints of budget and common sense. Dimensions confirmed: 20" x 72" (51 x 183 cm). Thickness is variable over the mat, especially the inflatable section, and I did not attempt to confirm this measurement. Storage sack: black nylon mesh, with compartment in base containing two patches for the inflatable portion (black and red) together with adhesive. These are contained in a plastic bag. Instructions for repair (simple, and easily accomplished in the field) are included on an enclosed card. The pad arrived safely, in the mesh storage sack, protected with a plain plastic wrapper. There was no hang tag present, nor other literature. I called P.O.E. to inquire about this. It seems that this was part of a batch reserved as samples for testers, and no hang tags had been attached. The commercially distributed product does have one. An example of the tag is en route to me. My understanding is that there is no difference between what I received and what is generally available, other than the hang tag. Update, April 12 2007: Pacific Outdoor Equipment kindly sent me the original retail wrapping materials. The mat comes in a printed plastic sleeve, with text in French and English. The description of the product on the sleeve includes the fact that the valve is made of hard anodized aluminum, that the foams are treated to prevent fungus and bacteria, and that the mat has a DWR finish. It also discusses the aerogel core of the pad, and the stuff-sack and repair kit. It appears there is no hang tag. "All Insulmat and WXtex products are warranted against defects in materials and workmanship for the lifetime of the product. Should at any time you find one of these rare defects, we will repair or replace the product at our option. We'd much rather keep our gear out of the landfill and in service. If a product should develop a problem as a result of normal wear and tear, misuse, alterations, or a random act of Murphy, we would be happy to provide an estimate and help you repair your gear at a reasonable cost. If an issue should arise with one of our products, please contact our warranty department at (406)-586 5258 support@pacoutdoor.com for further assistance and shipping instructions." Little information is given on the P.O.E. site regarding the materials and construction of the Hyper High Mtn pad. What is provided indicates that there is an Aspen Aerogel insulation layer under the torso and feet, and that the pad is otherwise constructed of "light and warm PE + 13mm EVA foam." Also stated is that the pad is trimmed to a mummy shape for weight savings. A little elucidation is probably in order here. The exciting feature of this P.O.E. product is that it is, to the best of my knowledge, the first application of aerogel technology to a sleeping pad. 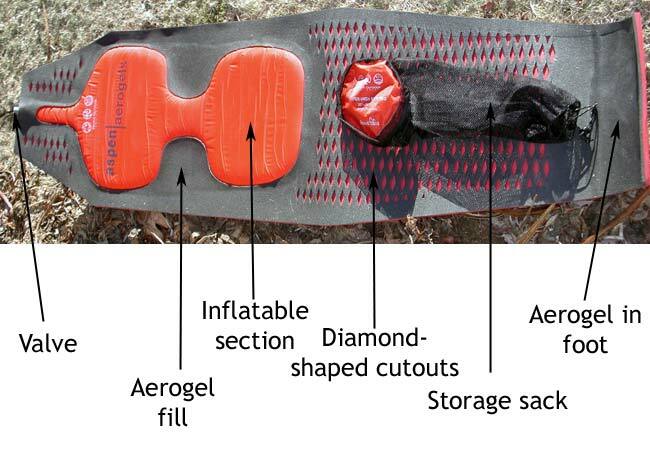 Indeed, I'm not aware of the application of aerogels to any other recreational outdoor products but insoles, as of this time. Since a technical treatise isn't called for here, it's enough to say that aerogels are a material initially developed in the aerospace industry, primarily as an insulator. Despite the "gel" in the name, they are in fact solids, albeit incredibly light ones. Indeed, aerogels are considered to be the single most effective solid-phase material for thermal insulation. Unlike most such materials used in outdoor pursuits, their insulating ability is not dependent on loft. The downside is that they are not easy to work with, and that their fine fibrous nature makes inhalation inadvisablefor safe use, the aerogel must be carefully encapsulated. Here, it is in some manner sandwiched between the layers of EVA (the plastic ethyl vinyl acetate). Therefore, home modification of this pad would be a very poor idea! The base of the pad is a red EVA layer, imprinted with the P.O.E. and Aspen Aerogel names, writ large. The upper (sleeping) surface is of black PE (polyethylene), with a pattern of diamond-shaped cut-outs (the firm calls this their "Diamondback" surface), presumably for weight reduction and perhaps also to act as reservoirs of warm, trapped air. This surface also bears proprietary logos. The aerogel is bonded in strategic locations (torso and feet) between these two layers. Also sandwiched between the two EVA sheets is an inflatable section (material unknown), clearly designed for comfort (and intended to provide further insulation). This is located under the neck, shoulders and hips, in an approximately hourglass configuration (see image below), and it's inflated via a valve at the center of the upper edge of the pad. Inflation is easy, as the volume is small. Pressure in the inflated compartment is easily adjusted for optimum comfort by gently releasing air from the valve control, which screws in to shut, out to open. The quality of manufacture appears high, and this even extends to the neatly designed storage or carrying sack. I would imagine a great deal of thought and research went into the design and construction of this pad, and it shows. In theory, then, the insulation from these two pads, under my torso at least, is around R 6.9. The weight of this setup is 35 oz (992 g), i.e. 10 oz (283 g) heavier than the Hyper High Mtn pad. The bulk of the P.O.E. pad is less also, and should be far more easily carried, either attached externally to my pack or arranged as an internal wall (standard procedure when packs with no framesheet are used, as this assists weight transfer from shoulder to hip). I will report on the ease of both carrying configurations from the field. The P.O.E. site does not discuss the R-values of the Hyper High Mtn, but I inquired about this when I called the company. An R-value of 20 was given for those sections of the pad that utilize aerogel, and a value of R 8 elsewhere on the pad. This is very substantial indeed, and if it performs as billed, the pad should be exceptionally effective. Since the down beneath a sleeper lying in a sleeping-bag is compressed, it has very little insulating ability, and without a pad, much body heat would be lost to the ground, regardless of the rating of the bag. Of course, I usually use a sleeping pad, but the thermal resistance of most is quite low. This can be a major source of discomfort and one important cause of "sleeping cold." Anyone who customarily camps on snow will have had the experience of having to peel their groundsheet or tent from a layer of ice underneath when breaking camp, even though they were lying on powder snow when the tent was set up the night before. That ice is caused by melt from escaped body heat. This highlights the extent of heat loss, and underlines the fact that any improvement in ground insulation is likely to add substantially to sleeping comfort and warmth. In fact, in winter, I consider the pad equally as important as the rating of the sleeping bag. I will be heading out for my first backpack with this pad in another week. I have tried simply lying on the frozen ground outside on the pad, and it seems to radiate warmth. This is, of course, physically impossibleit is merely preventing my body heat from escaping to the cold-soaked ground. Still, as a preliminary indication, this is encouraging. The pad was also very comfortable, provided that my hips and shoulder were where they were supposed to be, on the inflatable pads. The only negative aspects I've noted so far are very minor indeed. The pad does tend to keep its curl when initially laid out on the ground. Once the sleeping bag is loaded on top of the pad, it conforms to the surface it's lying on. Gentle manipulation by hand by bending in the opposite direction seems to be a fairly effective corrective if the curvature proves awkward. There is a tendency for hair, bits of leaf, dust etc. to cling to the surface of the pad. It may best be kept clean with a gentle application of tape, or perhaps a clothes brush lightly applied. I expect (based on what I was told) that some cleaning instructions will be on the missing hang-tag, and I will include this information in the field report. The website has some care information, but given the special nature of this pad, I prefer to see if there are any specific instructions. It will be interesting to see if this "clinginess" indicates that the pad will not easily slip on tent floors, something that can be an issue with inflatable pads. My initial reaction to the mat is very positive, though tempered by the fact that, for now, my enthusiasm is based on theory, not practice! I'm always excited to see new technologies appear in outdoor gear (or, indeed, in any aspect of daily life). I would be the first to admit that only a small percentage of the backpacking population enjoys winter camping, but for those of us that do, any product that actually reduces the weight that I carry while increasing my comfort can't be anything but good. I very much hope this performs well. I will test the pad under very cold conditions in what remains of February, on through March (often bitter in the mountains), and then in the milder but still occasionally cool months of April and May. Please check back in approximately two months for my Field Report. I used the Pacific Outdoor Equipment Hyper High Mtn pad three times during the test period, all in the Catskill Mountains of New York State, to elevations of about 3000 ft (914 m). In each case I was camped on snow, at temperatures between 15 F (-9 C) and 35 F (2 C). I was using a four-season tent with a small footprint (the Sierra Designs Divine Lightning, specifically). The Hyper High Mtn mat was an excellent fit in this small, rather narrow tent (a bit bigger than a bivy). I used a silnylon poncho as a groundsheet, to protect the floor of the tent against snow abrasion. My sleeping bag was a Valandre Shocking Blue bag or (on one milder temperature trip) the Valandre Mirage bag. I experienced some light snow on one trip, but otherwise had no precipitation. As I used the pad on overnighters only during the field test I found a GoLite Gust (long) of about 5000 cu in (82 L) to be adequate as my pack. This has a foam framesheet only, and little in the way of attachment points to fasten the pad externally. I found that carrying the pad rolled in its sack took too much pack space, making it awkward to fit other items. Instead, I coiled the pad within the pack (which also helps improve weight transfer) with the pad's bottom side facing in, in order to help counter the tendency of the pad to curl. This works well, leaving more than enough room for my other winter gear. I do find that I have to be careful of anything that might dig into the foam base and leave an indentation. This base is fairly soft in texture. It scratches fairly easily, too. It shows pressure marks for a time, but most of these don't seem to be permanent. The underside now has a fair number of minor snags and dings, though nothing that is likely to impair performance. As I usually do, I sat on the pad while I cooked and ate. It provided a comfortable and warm base for the purpose. I did notice an unfortunate tendency for the diamond-shaped cutouts to pick up snow and ice when exposed in this way. Most of this could be dusted off, but some, where my body heat had melted it slightly, proved a bit tenacious. This is a relatively small issue, though any snow that gets carried into the tent on the mat is likely to melt and soak into the fabric of my sleeping bag, so I found I needed to be quite careful about this. I was rather surprised to see that there was evidence of snow melt under the pad after sitting for comparatively short periods, an hour or so. This has often been the case with standard sleeping pads, but given the high claimed R-value (the Pacific Outdoor Equipment website states "an amazing average R value of 20"), I had not expected to see any melting at all after such a short period. This had no practical impact to speak of, but did puzzle me. I found the pad to be more than adequate to the conditions I experienced. Though the lowest nighttime temperature at which I used the pad was around 15 F (-9 C), the snow had been cold-soaked by lower temperatures in the week previous, When, as occasionally happened, an arm or leg drifted off the pad, I could feel a clear line of demarcation between the part of me that was cozily ensconced on the pad and the bit that wasn't. I was overly warm on one trip, but part of that was due to the fact that my bag rating was higher than needed, as I had anticipated temperatures of 0 F (-18 C), and these had not materialized. Still, there's no question that the pad performed well. Sleeping comfort was at least adequate. I'm a side sleeper, and the inflatable sections provided some padding to whichever hip was in contact with the pad, though perhaps not quite enough. I'd conjecture that the pad's arrangement of inflated areas works best for those who sleep on their backs (unfortunately, I snore terribly if I do). In the long term test period I'll be testing the pad for comfort on the cold hard ground, but on yielding snow it was fine. On packing up in the mornings, each time I saw significant evidence of melting in the area where I had been lying. Largely as a result of this, I decided to, as best possible, examine the claimed insulation value of the pad. Some while ago I purchased a pair of iButton temperature data loggers (Thermochrons). These ingenious little electronic devices can be programmed in advance to measure temperatures repeatedly at a previously specified interval. They are incredibly handy for gear testing (and a wide range of other purposes). The temperature record is stored digitally in internal memory, and can be retrieved by placing the button in a special reader attached to the USB port of a computer. An earlier version of this gizmo was reviewed on BackpackGearTest, and can be found by searching on "iButton." My other item of testing equipment was a constant-output temperature pad that I used to use for starting vegetable plants in the spring. This provided a steady heat source. My first thought was to compare the insulating qualities of the Hyper High Mtn pad with two pads whose R-values were known (from manufacturer statements). Both pads that I used are made by the same firm, one that specializes in sleeping pads. One is a folding closed cell pad, which has a stated R-value of 2.2. The other, no longer made, has an R-value of 4.7. This is a self-inflating mattress of 1.5 in (3.8 cm) thickness, containing foam (probably open cell). Both pads are very much standard-issue products, nothing special. Though I have to take these R values on faith, they are very much in line with such products generally, and are unlikely to be significantly at variance. If anything, since both have been well used (jointly, this pair have been my winter pads for a number of years) the manufacturer's value may be slightly on the high side. I first compared the insulating qualities of various pads. I placed an iButton Thermochron under the sleeping pad I was testing. I put the heating pad on the upper surface of the sleeping pad, centered over the temperature recording device that I'd placed beneath the pad. I covered the pad with some books, to ensure solid contact and to provide some thermal mass. I'd previously programmed the Thermochron to record temperature at one minute intervals. I then recorded the temperature under the pad over a period of 8 hours (the length of an average night's sleep). I used this procedure on successive days with the Hyper High Mtn pad, both of my "other brand" pads separately, and then with the two "other brands" stacked together (giving a total R-value of 6.9). This was done in the house, to minimize variables such as variations in air temperature and variation in the initial ground temperature between test runs. After the test, I imported the data using my iButton reader, placed the temperature values in an Excel spreadsheet, and output the results to a graphing program. The chart below was the result. Note that the lower the temperature measured after 8 hours, the more effective is the insulation (in other words, on the graph, red is better than blue; orange is intermediate). I was rather startled by these results and a little bit dismayed. I was hoping to see that the Hyper High Mtn pad provided an exceptional level of insulation. Instead, my pair of "other brand" pads provided the best results, followed by the P.O.E. Hyper High Mtn pad. The separate pads performed relatively poorly, as expected. The experiment was repeated several times (one repeat for the P.O.E. pad is shown on the chart), with very good agreement between runs. With the Hyper High Mtn pad, I chose to put the Thermochron at what should be a "sweet spot," directly under the inflatable torso section. Based on the results above, the insulating value of the P.O.E. pad under the torso appears closer to R-7 than R-20. This procedure was repeated twice, with good agreement. There are, of course, many sources of potential error in a home test of this kind. Though I have tested the Thermochrons and know them to be pretty accurate, there is a measurement tolerance, to the order of perhaps 1 Centigrade (1.8 Fahrenheit) degree. The assumed R-value of 4.7 for my mat could certainly be off, though for a self-inflating mat of this thickness, it is unlikely to be significantly higher. However (and this is an important proviso) the effect of the various errors is likely to be small. The two distinct methods of testing used (bracketing and direct calculation) consistently show that the R-value of the Hyper High Mtn pad is not unusually high. If the R-value of the P.O.E. Hyper High Mtn pad were 20, or even half that amount, the results of these tests would appear radically different to what I observed. There would be clear and unequivocal superiority in performance. This isn't apparent from the results, and I am led to the conclusion that Pacific Outdoor Equipment has made an error in its claimed R-value. My field results (snow melting under the mat etc.) all seem to consistent with this. My observations and testing to date indicate that the POE Hyper High Mtn mat is a serviceable winter sleeping pad of good design. I am satisfied by its field performance. It does not have the extraordinarily high level of insulation that I had anticipated, based on the R-value claimed by the manufacturer. I still expect to use it as my winter mat of choice, despite this. It is reasonably compact, sufficiently warm, and much lighter than (for example) a down air mattress, or my previous pair of pads. I have further tested the POE Hyper High Mtn sleeping pad over the months of April and May. Unfortunately, with the exception of a severe April high-elevation snowstorm, the weather here has now rapidly moved from spring-like to summery, with nighttime low temperatures at elevation generally above 50 F (10 C). I was able to use the pad, at elevations to 3500 ft (1067 m), for three more days of backpacking, before temperatures reached these levels, where summer gear is more appropriate. All trips were overnighters in the Catskill Mountains of New York State. On one occasion I was camped on bare rock (at a nighttime low of about 45 F, 7 C), on another in slushy snow (with a nighttime low of perhaps 32 F, 0 C), and on a third trip on duff (with a low temperature approaching 50 F, 10 C). Although the Hyper High Mtn pad is theoretically usable over four seasons, and is so rated by the manufacturer, it doesn't make a great deal of sense to me to carry it in conditions where the issue is likely to be staying sufficiently cool, rather than keeping warm. Unfortunately, with the end of winter and the onset of a rather humid May, this was exactly the situation with which I was faced during this long-term test period. Fortunately, I had three backpacks where the overnight temperatures, while hardly bitter, were at least not totally inappropriate to the use of a cold-weather pad. The critical factor with any sleeping pad is far more the ground temperature than air temperature. Much (I would say most) potential heat loss occurs between the sleeper and the ground, and the greater the differential in temperature, the more severe that rate of loss will be. That's where any sleeping pad's ability to insulate comes in. In only one instance during the long-term test period would I say that this differential was considerable, which was when I was camped on the residue of an April snowstorm that ravaged the Catskills. I was using a bag rated 23 F (-5 C) on the snow (the Valandre Mirage), and a 35 F (-2 C) bag on the other two occasions on which I tested the pad (a Mountain Hardware Phantom). In all instances I was wearing briefs and a short-sleeve shirt, and was sleeping in a Tarptent. Each time I was (at minimum) comfortably warm. In fact, I verged on "too hot" at some point on all three of these nights, usually during the first few hours, though on one occasion I grew warm as a front blew in towards morning. The mat's insulation was likely a contributor to the excessive warmth. In part because of weight, and in part because of the potential for overheating, the Hyper High Mtn sleeping pad would not be my first choice for "hinge season" backpacking, if I were not testing it. It should be noted that I am an average to warm sleeper, so what for me is an inconvenience (albeit fairly minor) might well be a big plus for a cold sleeper. The pad has been very comfortable to sleep on, and I have had no problem keeping my hips and torso on the air cushioned areas, which provide a much more luxurious degree of padding to that I've been generally used to. This was particularly useful when I was pitched on rock. I give the design high marks for comfort. It also isn't as slippery on silnylon tent floors as many pads. I do bead my tent floors with silicone sealant, but still tend to slide around quite a bit on many pads. When using the pad outside the tent, to sit on while cooking and for lounging around, it was equally comfortable. Provided that I'm careful not to get any dirt into the cutouts on the upper surface, it's very handy for out-of tent use! The lower foam surface does show the impression of any twigs, etc, beneath the area that I'm sitting or lying on, but this (as noted in previous reports) tends to disappear over time. I do find it is necessary to lightly hand-brush the pad to remove debris before carrying it to the tent at bedtime. There's a certain amount of "static cling" but it isn't excessive. Overall, the pad remains fairly clean and I haven't felt the need to sponge it down at all. The inflatable torso and hip section has remained sound. There have been no punctures, and the valve continues to work well. I've not noticed any issues with loss of inflation. Generally speaking, the pad's durability seems good, other than some minor scuffs to the softer foam on the underside. I wouldn't expect these to have any real impact on the insulating ability. I have carried the pad in its storage sleeve just once, as I've generally used it as an unfurled cylinder in a frameless pack to improve weight transfer. This does expose the pad to more wear and tear, though. The testing in this long-term period has been limited by the rapid disappearance of winter. Based on my field experience, I do think the pad is overkill for early to mid-spring in my region, but it does offer a high level of padding, especially useful on rocky terrain, that may make it tempting for some locations where I might not normally carry a pad of this heft. It seems durable and well made, and I expect to use it for some years to come. I anticipate that I will continue to use the Hyper High Mtn pad for cold-weather use primarily, but I do expect that it will become my standard pad under those conditions. Despite the fact that it is not as effective as insulation as I had anticipated from the manufacturer's literature, based on my testing to date it is clearly adequate for the typical winter use to which I will put it, and it is substantially lighter and more compact than my existing pad combination. This is an important consideration for a season when higher pack weights are the norm. It seems sufficiently warm for most of the winter settings that I'm likely to encounter here in the north-eastern United States. I don't anticipate using it that often at temperatures (air or snow) that are much below 0 F (-18 C), as I do only a few outings each winter where the temperature falls much below that. This is more a reflection on recent winters in this region then on my preferences for camping conditions, as I like it cold! On those occasions when I will be traveling in deep winter conditions, I may decide to carry a small auxiliary mat to boost my ground insulation if needed. It may be that this will prove an unnecessary precaution, but I feel it is a sensible one until such time as I have been able to test the pad in truly cold conditions, an opportunity that this winter past failed to provide. I will, at that time, post an addendum to this report. This concludes my testing of the Pacific Outdoor Equipment Hyper High Mtn Sleeping Pad.